On a return trip from Perth we allowed ourselves time to check out a few natural areas. Areas that would otherwise be too far from Home to justify the trip just to look them over. If a place shows promise, we’ll return when we have more time. If it doesn’t … at least we didn’t drive all the way to (for example) the Portland “Conservation Area” from Home to find nothing more than a boat launch. However one of the “wins” this time was the Menzel Centennial Provincial Park. There’s all kinds of data on the I’net about it since Menzel is a “nature reserve” class park (just like Peter’s Woods). Menzel Centennial (like all nature reserve class parks) exists because it’s intended to protect something environmentally significant. This one is to protect/preserve the bog, fen, and alvar habitats, as well as the Salmon River watershed headwaters, and an assortment of reptiles, amphibians, rare butterflies, animals, and plants. The return trail (the only trail) is 1.7 kms long (one way), with 427 meters of boardwalk total (there’s two of them). The trail ends at Mud lake, which isn’t muddy at all. Menzel is very easy to get to (I’m not even gonna bother with a map). Just take Deseronto Rd North from the 401 (between Shannonville and Napanee) until you have to turn right. The road becomes Roblin Rd at the turn, and the entrance is about 700 meters from the turn, on your left. You’ll have to park on the side of Roblin Rd. as there’s no parking lot. The trail starts by navigating the baffle entrance (to deter motorized vehicles) and walking up a slight incline to the trailhead. 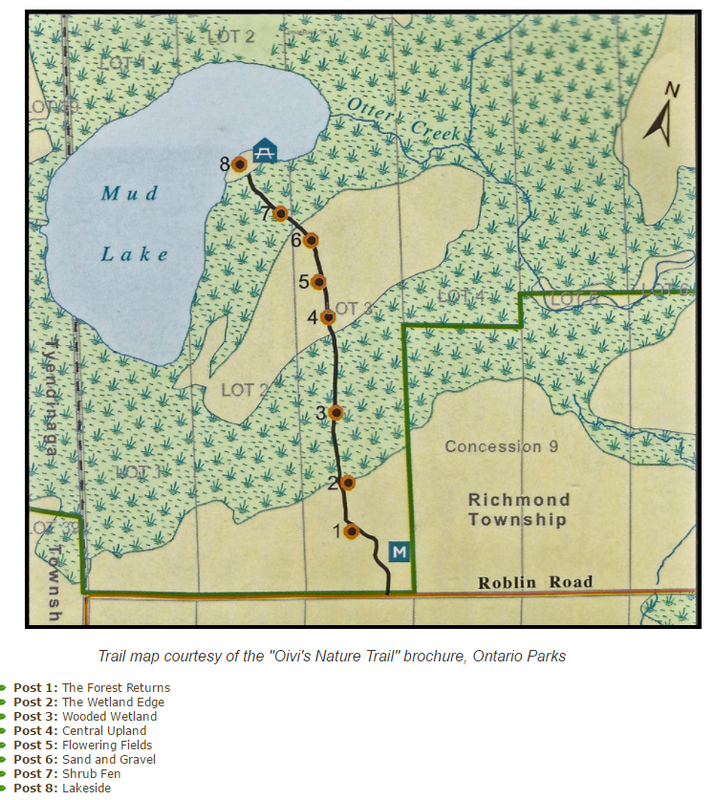 There you’ll find a map, a memorial, and general information about the reserve. The trail continues across a limestone alvar into an open meadow, and into as much a forest as can be expected in this terrain. Then comes the first boardwalk (the approach to which was a bit damp). From that boardwalk we spotted the biggest carnivorous pitcher plants we’ve ever seen (up to ten inches tall). We saw/heard many snakes on the trail. There are alot of (likely) hibernaculums between the road and up to, and including, the alvar. I spotted a coiled Northern water snake on a hummock, a few in the water, and many more which were just too fast to positively ID. Not wishing to be critical, but I must report that the boardwalks could use some attention. There are a coupla missing boards and a few broken ones. I deliberately walked on the edges (directly above the support beams) as it gave me a more comfortable feeling. There were a few fallen trees which made passage a bit challenging as well. From this boardwalk to the next is a low, damp forest where we saw cypripediums, and a tiny turtle about the size of a tooney. It dove into a small pool at the base of the boardwalk. The wife tried waiting for it to surface, but the clouds of mosquitoes got on my nerves. Did I mention not to even think about walking this one in warm weather without DEET ? It’s no worse than any other trail across bogs and fens though. The second boardwalk was a refreshing path over an open wetland (the first boardwalk was heavily wooded). The welcome breeze cooled us and made the mosquitoes go away. Once over the boardwalk, we plunged back into deep woods until a clearing ahead revealed itself to be the lake. A lovely clearing with a picnic table and a nice view. The lake was unexpectedly large and the shallow water near the shore was teeming with colourful little fish. Menzel is an easy and interesting walk through regenerating forests, alvar, and various different types of wetlands. There are significant species of, plants, insects, and animals present here. It’s the kind of place where, even experienced walkers can feel no shame in saying “I have no idea what that is. Take a picture and we’ll look it up when we get Home”. We were amazed at the number of snakes and butterflies in there, and even on the roads to and from. The trails and boardwalks are wide enough for two to walk at the shoulder. The boardwalks will need some serious attention soon though. There are a coupla fallen trees, one over the boardwalk (which can be lifted to get under), and one across the trail to the lake (yer crawling under that one fer sure). It’s buggy of course due to all the still water. However, there are more to bugs than mosquitoes, and we enjoyed the company of many different types of dragonflies and butterflies on our walk. In the right season, a lovely picnic could be had on the table at the lake. Other than that one, and another at the trailhead, there are no facilities of any kind anywhere (including a parking lot), and there is no charge to walk it. Great review…I would like to go there. A bit out of my area..Millbrook. Thanks again for taking the time to let everyone know. And I’ll thank you again for your thoughtful comments Kevin. Hopefully our next reviewed trail (Durham East Cross Forest) is near enough for you to enjoy.